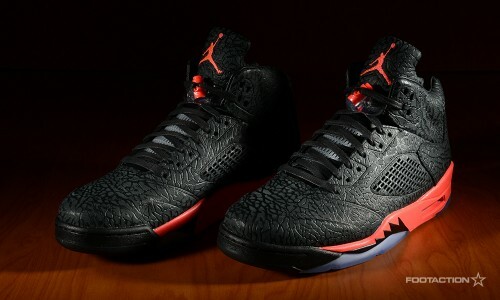 In September, the Air Jordan 3Lab5 that released were dominantly Elephant skin print referencing the Jordan III. Although this second release is defined with the use of elephant print along the upper, the pops of color in the sneaker are along the midsole in infrared sitting atop an icy blue, semi-translucent sole. Word on the street is that these kicks are the introduction of the “Infrared 23″ shade in Jordan Brand’s color palette — one that’s to be sticking around for a handful of retro releases in the upcoming year. Releases in stores and online tomorrow. Check out Release Locator for stores. Print article This entry was posted by hhcblog on January 6, 2014 at 2:21 am, and is filed under Footwear. Follow any responses to this post through RSS 2.0. You can leave a response or trackback from your own site.